I’m so excited to finally share my thoughts on The Little Spoon freshly home delivered baby blends. Few weeks back we were able to give The Little Spoon a try for 14 days. I say 14 days because thats the longest period their fresh blends could stay refreigerated unless if you store them in the freezer. I wanted to start trying their different baby blends asap because come on the mixtures of different foods on the label just looked too good to wait! I’ll be honest I’m very picky with what I feed my kids and I try EVERYTHING before they do. AND MAMAS I AM NOT JOKING WHEN I SAY EVERYTHING TASTED AS LABELED!! The colors were so rich you can definitely just tell through the packaging. I’ll start off with the packaging these recipes are stored and delivered in. 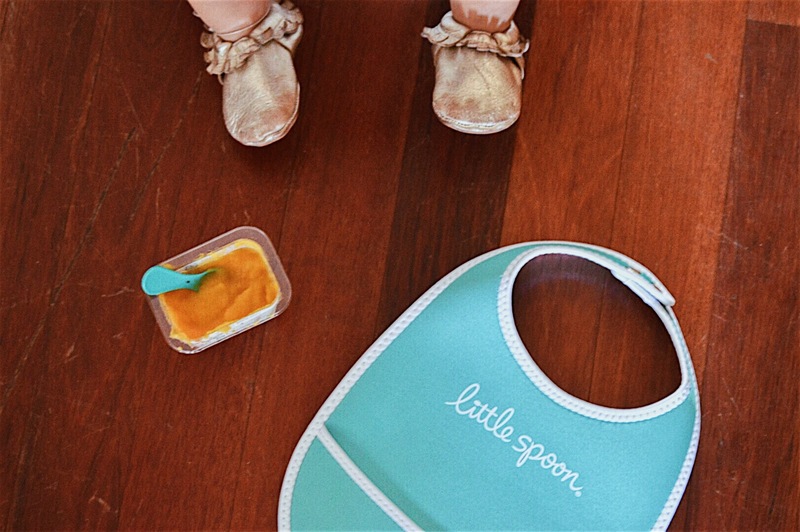 Each recipe of freshly made baby food is poured into a clear 4oz. container, air sealed (not heat pasteurized), and each top has a little spoon attached. I loveeeed this set up! It was such a breeze to just snap open and get straight to feeding Scarlett. The little spoon attached is quite small so when at home I would use our own just because it would get the job done a little quicker, but for on the go it can’t get better than that. Each container comes with a detail explanation of whats inside on its label along with detail pictures of each fruit or veggie used. Like I mentioned before the recipes taste just as described. They are full of color and some have a great texture to them. 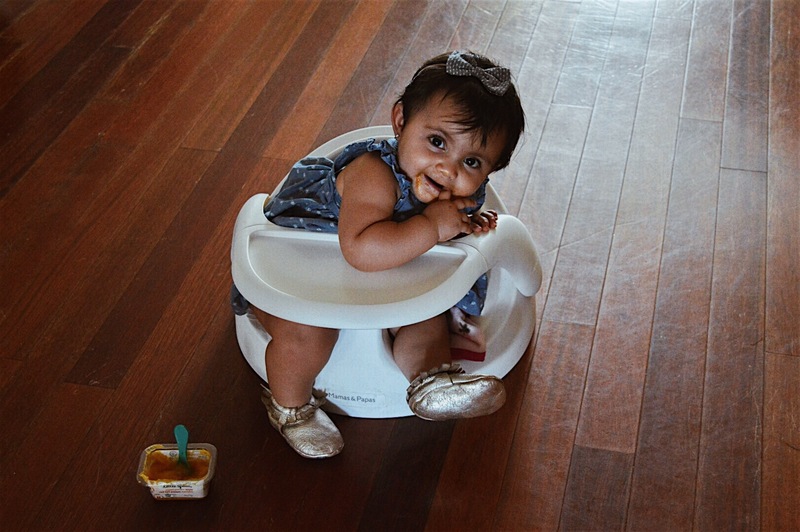 Scarlett had a few favorites starting off with sweet potato, apple, red bell pepper & turmeric and beet, banana, & mango. She found a love for bell peppers thats for sure. One of the recipes caught my eye and that was the chia mango and coconut milk. It never crossed my mind to feed Scarlett chia seeds so early. I throw them in my own smoothies and yogurt and sometime on Angelo’s. She loved this mixture together. One of Scarlett’s favorite fruits are mangos. She loved this mix so much I want to try making it myself. 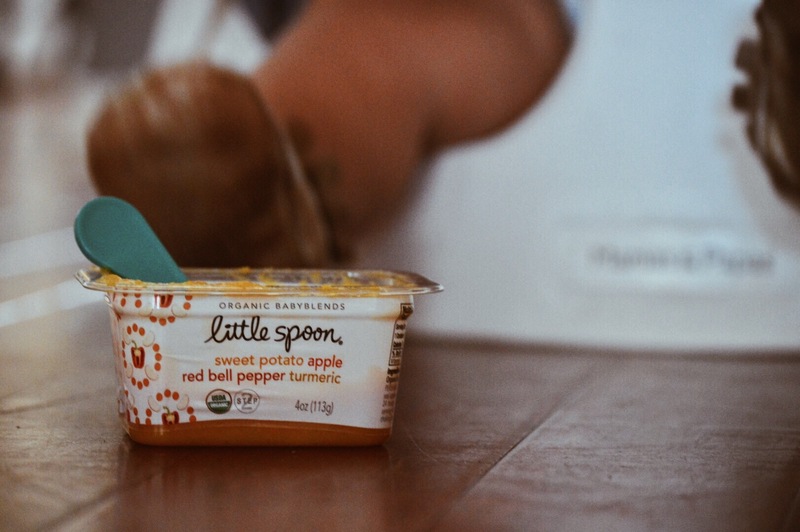 Overall, Little Spoon is a great alternative for that on the go/ working parent. 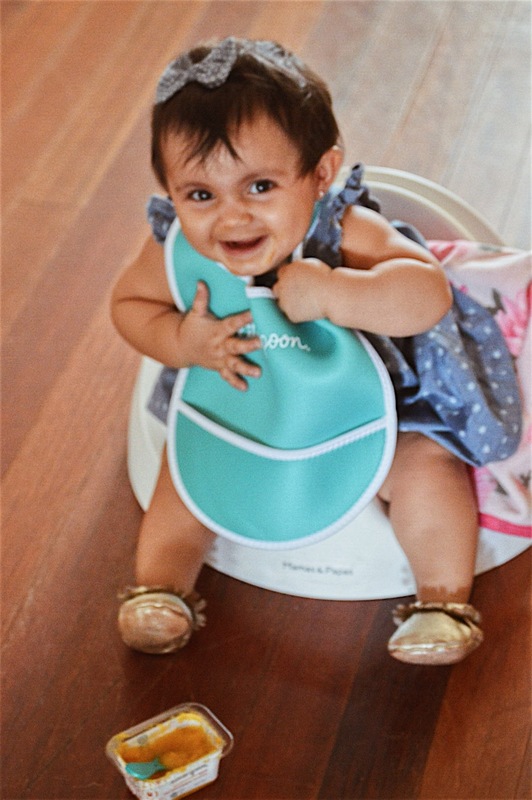 This is an awesome way to still feel like you are feeding your baby wholesome organically made foods. They are literally doing all the work for you! Even providing you with a spoon in case you forgot because you are so busy trying to pack a diaper bag and not forget your kids at home on the way out! Haha. Did you know in order for these organic food pouches or just pouches in general to last a lifetime on shelves without rotting they need to heat press the pouches which kills pretty much all the nutrients our babes need and just leaves an extremely high in take of sugars. I just learned this myself. I am a stay at home mom to two kiddos and my life is still a hot mess at times. I try my hardest to prep meals for Scarlett at least every week but there are times where I just can’t even squeeze that in and I lean towards food pouches. THIS is b e t t e r than food pouches ladies! You can visit Little Spoon on Instagram to request an invite! Disclaimer: I received this product for a review, but all opinions are my own. Yes I wish I would have known about this with my first. Thank you! My son was and still is a picky eater. I would totally try these if my kids were in that stage! They sound so easy and even as a stay home mum like myself, there are literally a million and one things to do. Having these on hand would be great in a bind! I feel like it’s hard these days to find baby food that is worth the money and tastes GOOD! Good to know there is a company out there!! Scarlett is too freaking cute I gotta give these babies a try!